Earlier, I posted about the birth of our last little one. But of course, her birth was only the first part of the story - those precious first hours of newness were far more full of wonder, fear and drama. And yet despite that, already my memories are blurred - did that happen then? when did that happen? Hmm. According to the photos that happened. Although the first immediacy is gone, I'm going to try to write it down so I don't forget yet more. It's now a year since our little one first sparkled into being - the promise of all she'd reveal herself to be coming together in an almost to-small-to-be-seen miracle of cells, and it's set me remembering. Our wonder-girl was born three months ago at 1.56 am, one of the hours of deep darkness, with many more to go before the dawn. White vernix still streaked her mass of dark hair, her skin was still plumped from her long immersion. Beloved handed her up to me as I stood naked in the bath, shocked that she'd arrived so many hours before we were expecting her. Slippery, perfect. After so long we met face to face. "Hello little one, you're here. You're here. Hello, my darling." The joy of having her finally in the world, her little red faced scrunched up, aggrieved, her tiny fingers and toes still ridiculously wrinkled, was overwhelming, but other factors were impinging. I was too dizzy, too scared of the jelly of my arms to hold her, so I relinquished her to the midwife to carry, wrapped a towel around myself and clambered unsteadily out of the bath. Leaning heavily on Beloved and dripping blood and water, I hobbled back to the birth suite bed. As soon as I lay down my little one was returned to me, warm, silken, wet, impossibly new and sweet smelling. I played with the remote on the bed until I was sitting up properly and there was a flurry of happenings around us. There was a sharp stab into my thigh as they injected the oxytocin, which speeds up the delivery of the placenta and aims to prevent excessive blood loss. 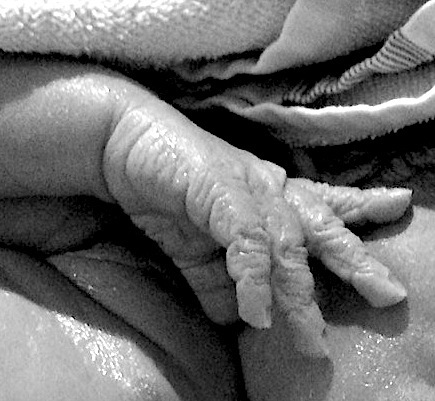 The third stage of labor the expulsion of the placenta was a slighter pain - hardly memorable - lost in staring at our little one, working out who she was, exclaiming over her little toes and her mass of hair, the swirls of down on her arms, her tiny ears. "Look at that hair on her back, she's a gorilla!" Beloved exclaimed. I looked up to glare at him. The placenta, like most placentas, was hideous, a flattish liverish looking mass. It had done it's job well (apart from the whole gestational diabetes thing) and it seemed a bit ungrateful to be so eager to be rid of it, but I was happy to have it taken away for inspection. While I held our little mite to my chest, waiting for her to show signs of wanting milk, my midwife clamped the cord then held it out to Beloved. "You ready?" It was the fourth time he'd cut the cord so he was prepared. It's tougher than it looks, an odd greyish, slightly twisted thing, that doesn't look like it's supposed to be on the outside of a body. It's a bitter-sweet moment, when that last physical connection goes, but you finally get to hold your baby on the outside. And it was about then that I felt the first big gush of warmth. I shifted slightly, and there was another. It felt like I was sitting in a pool. "Ah, I think there's a lot of blood," I told my midwife. She had a check, then took the mat under me away to be weighed. More blood gushed out. I tried to pay attention to how it felt so I could describe it in my writing, but it was hard to pay attention. It was beginning to feel familiar. I lost a lot of blood with my first - enough that I needed a transfusion - this was feeling very similar. Our babe was starting to make movements as if searching for milk, so I brought her higher, showed her where it was and that the supply was plentiful. Shortly after that the midwife connected a drip of clear fluid into my cannula and then put in a catheter. I didn't recall a catheter being so painful. It was a sting, a sharp discomfort. And sometime in there my midwife started pounding on my somewhat tender uterus. And there were further warm gushes. I gripped to Beloved's hand with one hand, held our baby with the other arm. Deep breath, deep breath. While my little one began showing an interest in the milk - licking, kneading, but not quite ready to latch, there was a steady flood of blood. The mat beneath me was changed again, and then again. Deep, slow breath. I have memories of them doing this with my firstborn - pounding on my tummy as if it were a boxing bag, but I was a lot more hazy then, half passed out with exhaustion and lack of sleep. This was sharp and clear and it hurt. Breathing deep I struggled not to tense, worried I'd squash our little babe. I told myself This is nothing, our babe is here, look at her darling toes. Who are you my little one? I'm in awe of the promise of you. The joy and honour of seeing you show yourself. The doctor came in - she looked fresh and alert and very capable, with short dark hair and well done makeup. She pounded on my abdomen as well, and more blood gushed out. And more. Darling babe. I stared at her face, trying to memorise. Remember. The kneading was just a distraction. "Have you decided on the name yet?" my midwife asked. I looked up at Beloved. We'd been in negotiation for awhile, although I'd never had any real doubt about whose choice would win out. It does a lot to put the ball in your favour to have recently gone through several hours of intense pain and still be bleeding a substantial amount. Our little girl is Anna. My choice. I love the simplicity and elegance of it, the history of it. And I have never met an Anna or an Anne who wasn't lovely. Obviously, Beloved will call her by his choice, now her second name, and she'll decide when she's old enough. Cold wrapped around me. I started to shiver. Someone brought some warm towels and wrapped them around my shoulders and I tucked them around Anna as well. I adore warm towels - one of the many perks of hospitals. Warm hospital wraps are loosely put around Anna so we are cocooned in cloth and warmth. Hunger started to attack. After a few months on a hospital ordered limited carb diet for gestational diabetes I'd been dreaming of this moment. I look up at Beloved. "Pink donuts. I'd really, really like some pink donuts." Of course, being the middle of the night there was nowhere to get any and, despite my capacious bags and much wracking of my brain over what to bring, I didn't have any donuts with pink icing packed. I had some rather disgusting dairy free chocolate instead. It had some sugar in it so I ate it. "I'm going to have to have a look and see what's wrong," the doctor said. That didn't sound good. "Have you taken gas or anything?" she asked. I shook my head. "Would you like some?" I shook my head again. The time I had gas with my first born I threw up. "Would you like some endone?" I'd never heard of endone. It was more than thirty hours since I'd slept and so hard to take things in, but I was fairly sure I'd never come across endone in my research on painkillers. "What are the side effects?" The doctor was a bit sketchy, but told me they'd give me some medicine for the nausea. Nausea? I was decided. I didn't want anything that brought nausea as a side effect. I'd prefer to get the pain over with and not have any lingering stuff. "No, thank you. But I'd like a panadol." There was general laughter but I'm a big believer in placebos. I returned to studying my little one. This newness goes so quickly. The skinny toes, the narrow feet, yet to plump up. Her little mouth. She had darker pink markings on her eyelids and forehead, similar to ones her oldest sister had. They'll fade in time, but for now I'm glad of their distinctiveness. It would be impossible to mistake her. The doctor reached up inside me. (This translates to 'shoved her fist up me'.) I couldn't help an indrawn breath and concentrated on not holding Anna too tightly, on steady breathing. O God but it hurt. Hands should not go up there. They just don't fit and everything is raw and sore and deep breath. I can't tense up with the pain, I'm holding my baby. Muscles relax. The catheter dragged and ached and I swallowed. And swallowed again. This kind of pain was supposed to be over. It was in the contract somewhere, wasn't it? Inhale one two three. Exhale one two three. I didn't go to any childbirth classes with this baby, or indeed the last two, but made a real effort to get to prenatal yoga, relishing the time out from busyness to concentrate on the one within. The breathing practice was a God-send. I congratulated myself on making the right choice. One two three breathe out, steadily. I studied the wet swirls of Anna's hair. The small streaks of white vernix. Her weight and warmth were so exactly right in my arms. Nothing (except the other three) had ever felt so perfect. There is nothing softer than her silken skin, her hair. Her little foot was smaller than my pinkie finger. I ran one finger along her sole and her toes flexed. I held her miniature hand, besotted. Surely, it couldn't last much longer. Surely. What was the doctor doing up in there? Excavating? Surely not much longer. "What exactly is a clot?" I asked, feeling dim. "Why do I have one?" I remember clots the size of lemons coming out after Adventure Boy. It freaked me out a little. It turns out the clots are just congealed blood. As a concept I didn't approve and I still didn't understand how the blood congealed quickly enough to have formed the lumps after the birth. It hadn't been that long. Finally she stopped rummaging and withdrew a large chunk of dark, jelly-ish red, about the size of her fist. I heaved a normal breath. Through the window overlooking a courtyard, the sky was beginning to lighten. Although we were in the hospital less than two hours before Anna arrived the other 'stuff' took nearly twice as long. "How much blood have I lost?" I asked, as the mat was taken away again to be weighed. "Not enough to be interesting," Beloved told me. I rolled my eyes but it was strangely reassuring. Interesting is bad. Boring is good. It turns out to be over two litres. "More than with Adventure Boy." I think they've just been better at weighing it, not being quite so panic stricken. I know how much I lost with them both and I lost way more with Adventure Boy. "I don't think you should go into work today," I told Beloved. His face had a worrying greyish tinge. "Neither do I," said the doctor, who had recently had her fist in my innards. It turned out she was one of Beloved's bosses. It was somewhat odd having a husband doing an obstetrics rotation, thereby knowing all the doctors and midwives, when you're having a baby. Anna was taken from me to be weighed, measured, pricked and blooded again, and we commented on the shock of having a dark haired, small (for us - average sized really) baby after three large, baldish, blondes. We knew she was going to be small from a late scan, but the shock of the dark hair is a delight. Blonde was lovely but a change was welcome. Relieved that Beloved wouldn't be starting work in a couple of hours I sent him to look for coffee to help him make it home in one piece. The crowds left. Beloved returned with coffee and and then, under supervision, rifled through my suitcase to find Anna's first clothes and dress her - her little onesie - her beanie to keep her warm. The midwife swaddled her in the hospital wrap and placed her in a perspex bassinet. Further instruction unearthed PJ's and a robe and slippers for me. The robe had me so excited. I was actually chilled enough to wear it. Beloved reluctantly left, and although I begged him to get some sleep, I doubted he would - he'd probably try to stay awake to drive the kids to school. I asked if I could have the cords out - they were both uncomfortable - two persistent, sharp aches. The midwife considered, and then removed the catheter, but looked at the cannula and decided it needed to stay in, although it was disconnected from the drip. It was all blood smeared because they had to put it in during a contraction and it was very hard to stay still. My vitals were checked again and then with one last look at my sleeping little one, only her face visible from within her swaddling, beneath her blue velvet beanie, I pealed myself from the bloodied bed and hobbled to the bathroom and the blessed relief of the shower. As I made my way into the bathroom where I had laboured I heard someone say "It's like a murder scene." The water ran red as I showered and though I'd just spent nearly two hours in the bath it felt so good to be clean. I inspected the flaccid sack of the pouch that had held Anna for so long, but this time, unlike after my first baby, I was prepared for it. My balance was off, not having the solid weight of Anna within me, and I was ponderous with sleepless-ness and blood loss. Everything seemed slow-motion-y. Clean and dry it took me a long time to work my limbs into my pyjamas, get my arms through the sleeves of the robe, work out the maternity pads. I steadied myself against the sink. Warm and in fresh clothes I savoured the knowledge our baby was truly here. Through in that other room slept our baby. The world was a wonderful place. Emerging from the bathroom it was time for us to leave the birth suite. I was beyond tired. I shuffled along the corridor pushing Anna's bassinet - the midwife had gone on ahead to prepare my room. I couldn't remember what number room she'd said. Everything seemed momentous. Each step was slow, ponderous. I couldn't walk faster although I'd like to. I stared down at our little one, sleeping so peacefully. The corridors seemed to go on forever, and had a dreamlike look to them. This is the beginning. She is so beautiful. I finally found my room, two curtained beds in it, both empty. If it weren't for the bassinet I was pushing I would topple over. I looked around the room with gratitude. Here, my little one and I would spend time together, become properly acquainted. At home the chaos, madness and full-on-ness never-stop, but this would be our sanctuary, our time apart from the world to learn each other. Wheeling the bassinet over to the side of the bed, making sure her head would be on level with mine so I could look over and see her face, I tumbled into the bed. Crisp sheets. Mmm. So weary each cell in my body seemed weighted, to be trying to sink into the ground but mmm. Crisp sheets. I burrowed in. Turned to face my little one. Stared at her in the pale light of morning easing through the window. She was here. Our wonder-girl. Our Anna.